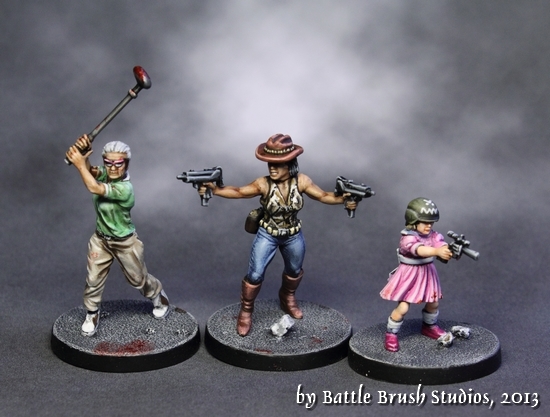 Today I would like to review Wargames Factory's latest release from their Dark Futures range. 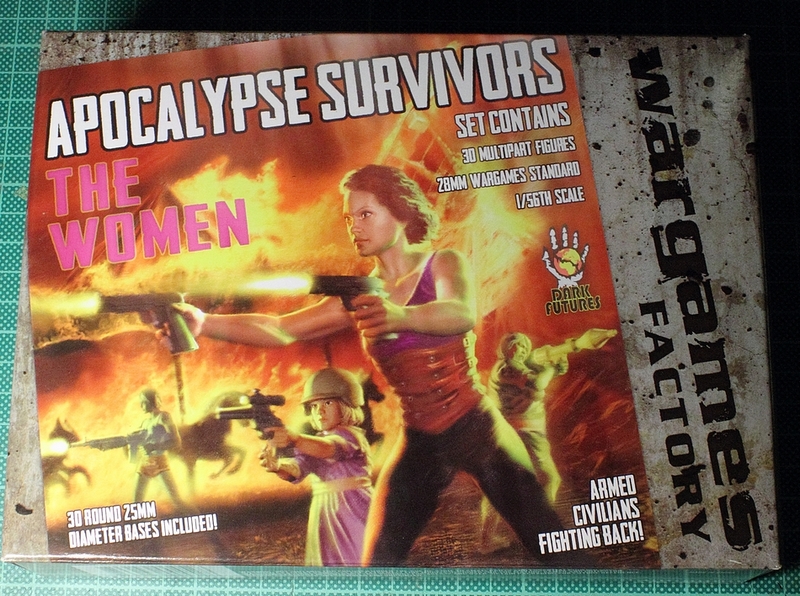 It's the hugely anticipated female apocalypse survivors. I actually have quite a lot of reviews lined up but due to requests (and WGF having gone through the troubles of sending me a review copy) I moved this up on the schedule. After the males went over really well with the general public, WGF made double-time on the survivor ladies. This review won't be quite as long as the one about the men because in many regards they are quite similar. I will get to this soon but let's start the review with a look a the box. The design is roughly the same as on the previous apocalypse survivors box with a concrete wall texture and the artwork being "slapped on" at an askew angle. Somehow I think that the design is a bit less well done on this one as on the previous one. No "rippled poster" effect, no white borders or stark orange-on-white. Last but not least "THE WOMEN" is written in purple on an orange/dark red background, therefore making it hard to read. It also looks a bit busy with text even though it's basically the same text. The artwork itself is fine. For some reason there are horses running in the fiery background. Don't know why, don't care, it's a great detail. This is Sigur From the Future and I bring news: I've got it straight from Wargames Factory that in fact, there is a burning carousel in the background. Not actual horses, but a stunning simulation. ;-) I'm just a weirdo who rather thinks of horses randomly running around the apocalypse instead of the slightly more plausible variant of carousel. Overall though, I liked the box front design way better on The Men box. On the back we got pictures of the models surrounded by scenery this time instead of a white background, along with some detail shots. No pictures of sprues this time. Text on the side is the same as on the Men box, just with some bits changed (naturally :P ). The cardboard is nice and thick, as usual with WGF these days, no plastic wrapping around the box but around the sprues. 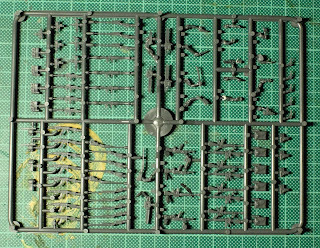 Three identical sprues with everything you need to build your 30 models (including the bases, plus a few add-ons like water flasks, a backpack two high-heeled shoes which are the nicest add-on bit on the sprue probably). 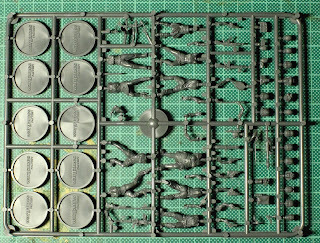 Plenty of head options - 15 on each sprue, incluing two heads each for the little girl and the heavy-set lady. Pretty cool rasta head on there as well. Oh yes, the little girl. 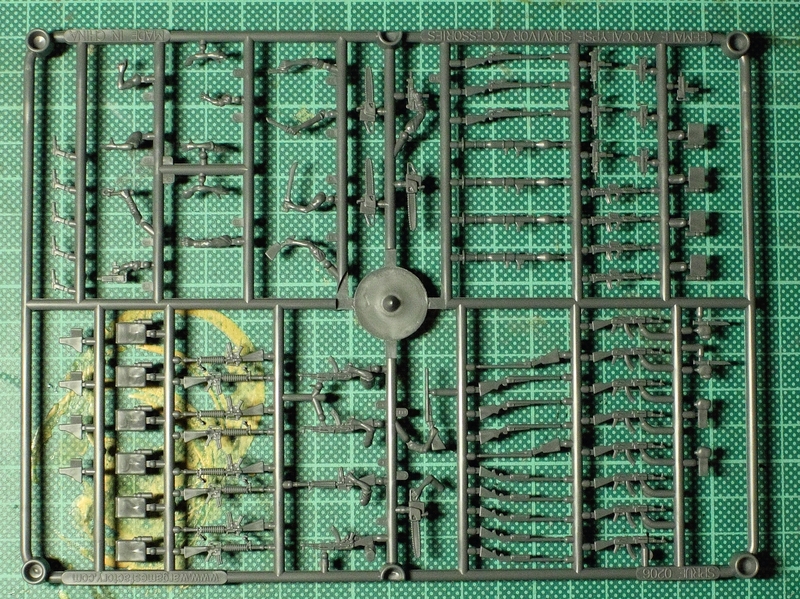 Yeah, there's a really young girl model on the sprue as well. 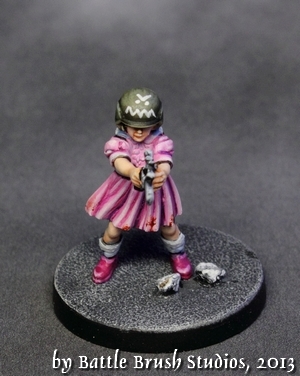 As I said in the previous Men review (which came with a model depicting a young boy) - some may have a problem with depitcting children in the midst of their wargames and I can completely understand that. It's essentially a case of take it or leave it. 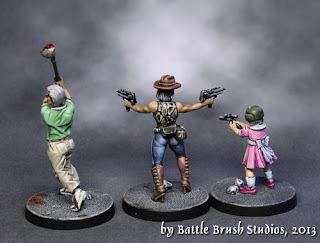 However, the girl adds some interesting modelling choices when it comes to archetypes like Zombie Little Girl, Avatar of Evil AI or Psychic Girl Saving the Day. So, what's new weapon-wise? The big thing you notice instantly: MISSILE LAUNCHER. (Well, rocket-propelled grenade launcher probably but let's not split hairs here.) Seven in the set in total. The single launchers can easily be used either as just stuff lying around, as "weapon" markers (these accessory sprues with the weapons without any hands or arms cast on always make me think of deathmatch-style mini games like FRAG. These weapons could be used to designate respawning weapons lying around and such. Or for 500 other projects.) or, with some little snipping, you can get some extra grenades for the launcher the model holds. Apart from that there are different submachine guns (uzi-style), less knives and pistols but a hatchet. 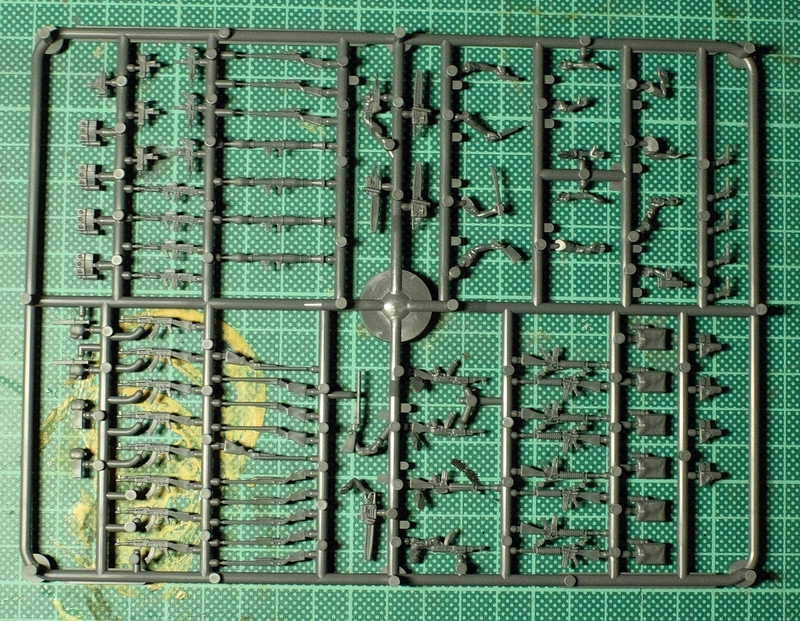 On the "core" sprues you also get a tennis racquet, a very cool looking sporting bow and a golf club on each. Oh, and Pipe Bombs. Overall, a whole host of weapons. Some more arms actually not holding a weapon would have been nice, but as with the Men box, these people are heavily armed. 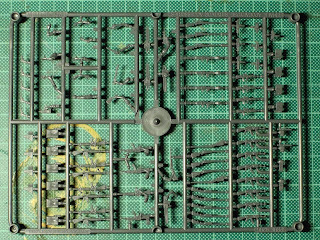 I have to mention though that, opposite to other recent WGF releases, there is some empty space on the accessories sprue which could have been filled with extra bits. Technically the models are the same quality as in the Men box: Casting crisp and clean, mold lines not too bad, stunningly detailled, parts fit perfectly well. 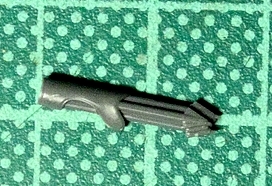 As with all multi-part plastics though you haveto fill the inevitable gaps between where the arm and torso parts meet. The faces (with three noteworthy exceptions) aren't horribly expressive or characterful but very well done. The poses are very familiar if you know other WGF products. I suspect the designers using the same "dummies" for all models and build up details around them. So you got legs very wide apart on many of the models, at least eight out of the full ten. Many of them look like they're doing a big step. For future releases, especially with female models, I would love to see some more casually standing or walking poses. Would make for a nice change. 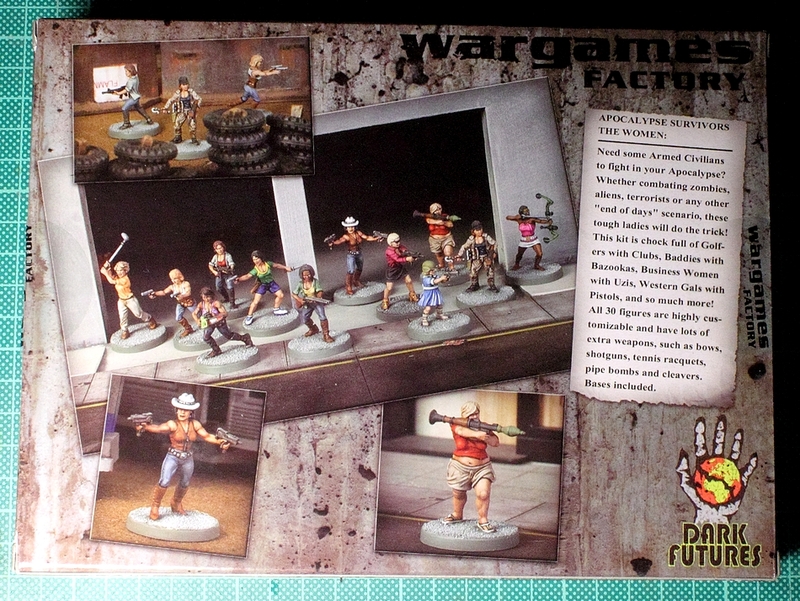 It's not like the poses as they are look too unnatural, it's just something I start noticing about WGF plastics. Why are the arrows in there the wrong way around? This led me to not using the bit on the archer model. "Great review.... As someone that uses a longbow on re-enactment, I can see why the arrows are that way round, the separator disks in most quivers are only suitable for 'bullet' -target points and not for hunting arrowheads -not suitable for a rear draw (robin hood style) but if carrying the quiver on your hip, its a much smoother draw motion as you are placing the heavy head at the bow first rather than trying to place it by holding the fletched end......"
So there, the quiver is in fact correctly sculpted. :-) Thanks, for die comment, Jason. They are of course based like the rest of my Urban Zombie Apocalypse collection, with simple pavement. Very quick and easy to do and it fits the theme. 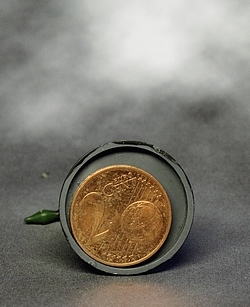 As with The Men, I glued coins into the bases to give the models a bit more weight. Now let's take a closer look at the individual models. From left to right: Chainsaw Lady, Survivalist Paramilitary Lady and Waitress Lady. Chainsaw Lady also got a little tattoo, mainly because the night I painted her I had a chat about Street Fighter 2 with a friend online. I definately wanted to have an older lady in the group so the golfing one it was, depicting the active senior citizen. Cowgal I had a lot of fun painting. I think the colour scheme works really well and my attempt at a fake snakeskin top worked out reasonably well. I also painted some random asian sign onto her water bottle because she seemed like the person that would have such a thing. The little girl was pretty much predermined. Blonde, pink dress. The helmet was too nice a surface not to add something so I added a monster face to scare the Bad People away. Shotgun Lady I slightly converted by replacing the regular shotgun with a two-barrelled one. Her shirt I painted to look like a flanell shirt because painting those is rather interesting and it adds to the character of the model. Even before release, Missile Launcher Lady was a notorious model from the box. She's the equivalent of the Big Guy from the Men box and even the zombies box. 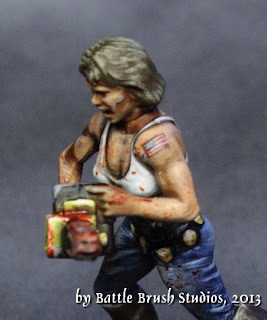 Shame that there's no heavier-set ladyzombie in the Zombie Vixens box. Not sure if it's visible in the pictures properly but on her I wanted the hair to look very bleach blonde with very dark hair growing back from where the hair parts. It's a very particular look we all have seen in real life. 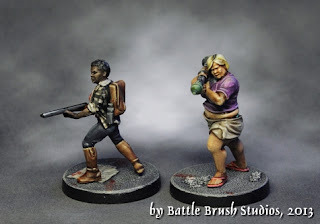 As with all the obese models, WGF have the trousers slip a little in the back so, for the sake of dignity, I freehanded a piece of cloth to cover it up. If a zombie outbreak is happening, you really don't want to be the person who's stuck with a tennis racquet for a weapon. Still, the option was there, I really, really liked the pose and I wanted to make her look extra defiant despite (or because of) her choice of weapon. She's supposed to be a sporty one so the skin is more tan, she's more muscular and she's got the right outfit on. Archer Lady I immediately had the plan to take some pointers from Dennis Rodman combined with someone who was cought by the outbreak returning from a nightclub. So she's got her hair dyed, some snazzy sunglasses, neon outfit, belt as wide as her skirt and I freehanded some glowy thing she wears on her upper arm. 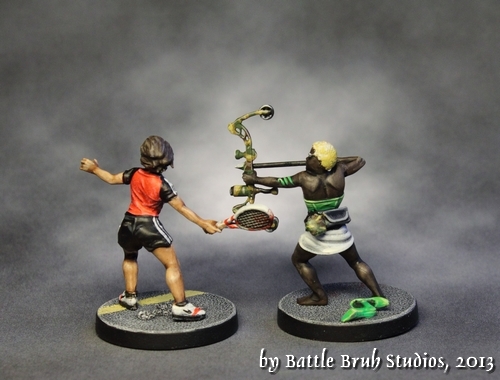 She seems to have looted a sports bow and arrows (at the same place where The Scout from the Men box got his crossbow probably because they got the same camo thing going on. Maybe they teamed up?). You can also see her high heels which she just took off for improved mobility. But let's not get carried away with backstories. What's my verdict on the offering? Well, it pretty much turned out as I had expected. WGF's quality stays right up there. 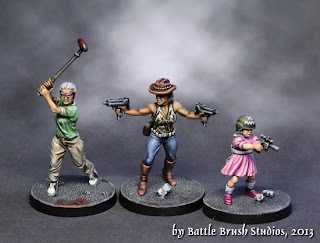 A bunch of inventive, fun things to do with the box and certainly a niche yet untapped in miniatures wargaming. The times being what they are, this is rather impressive. Sure, some of the designs are a bit in the comical side but to me, that's the spirit in which such settings should be enjoyed. 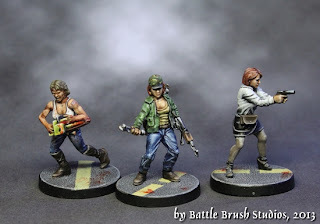 If you're going for something more "grimdarkgritty", the models will serve you well in this regard too though. The poses aren't very flexible in terms of changing stances but that's not a problem and you can change weaponry rather easily, especially with all the extra bits thrown in. The Women compliment their male counter-parts really well. 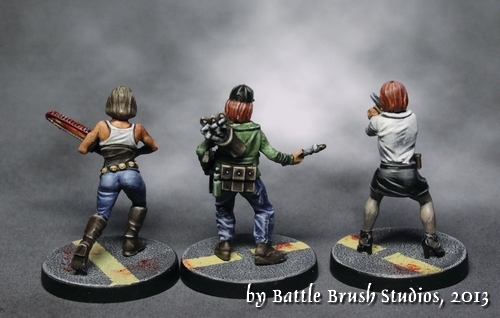 For the price, around USD 20.00, you get a lot to toy around with and if you're looking for modern, real-life based female civilians fighting back, these are the premier ones to go for. If I were to get nitpicky, I would have liked to see some more varied hairstyles, especially braids, pig- and ponytails. Those could have been seperate bits to be glued to certain heads. That would have been a nice addition to throw into these free spaces on the accessories sprue. Because, you know, Lara Croft. ;-) Apart from that, yeah, the box design itself is a bit of a step down from the Men box again but that's in the eye of the beholder. Actually, I think that there is a lot of potential for add-ons to this set and the Men box by adding hats, heads, additional outfits, equipment or bits in resin to the existing sets as seperate items. These are minor points though. Apocalypse Survivors - The Women is a magnificent, unique set of high quality plastic models that may not be universally usable but who doesn't like a nice zombie game and the models are just fun. 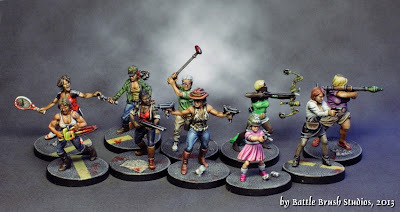 Fantastic painting and good builds. Your white looks so real, how do you do it. I've been fighting white for 30 years? @Rogzombie: Thanks very much. White can be a harsh mistress indeed. 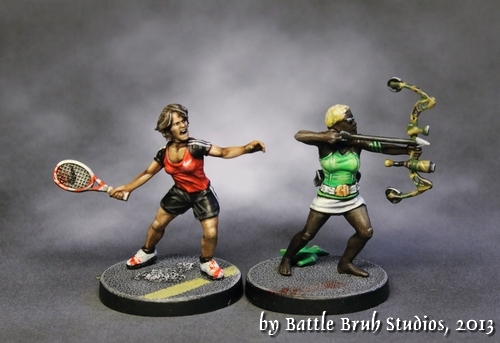 Especially with miniatures like these, I like to think what kind of fabric I'm painting and what that would look like. 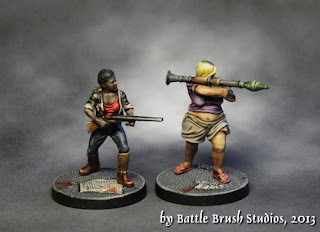 The skirt on the archer and the waitress's blouse got very strong highlights while the tank top on the chainsaw lady got much softer ones. If you want to make something look really white I think it's all about the shading. Sure, nothing is really white in real life and you can't place any highlights if a surface is painted all white for the base colour but that's less of a problem as long as the shading's done just right. Shading in the right places (don't be scared to use dark greys or blues for that for stark contrast) and not shading too much. Just a few folds. On 28mm mini I wouldn't bother with stuff like seamlines and such on white clothes. Hope that helped. Could it be a stealthy homage to Picasso's Guernica? These are really outstanding, both in sculpt and in painting! The quiver is sculpted incorrectly, anyone that says otherwise has never tried placing the arrows in a quiver that actually had SHARP broadheads on the arrows. Also in every photo I have seen, the arrow is on the wrong side of the bow as well. Thanks for the comment, Anonymous. The positioning of the arrow I was unsure about myself but I ended up doing it as it's on the back of the box. Let us all wish Club Lady good luck at operating the bow. In other news: The mystery of the burning horses is solved! I just got the info straight from WGF and put it into the article right away.